"Look, I've learned the hard way that hate feeds on fear. And if you run, hates wins." Last episode, I sent up a flare to catch up. I'm really glad that this episode reinforced that decision! It would be almost embarrassing otherwise. While not a lot happened this episode – the Struckers left Atlanta and immediately came back – there was a lot of set up done for the final two episodes. As I predicted, Agent Turner was back on the HOUND/Dr. Campbell bandwagon. I was relieved to see that he wasn't completely blinded by hatred, though. There was some discussion about how the HOUND project was inhumane. (Yeah, no duh.) Granted, the discussion didn't really go anywhere, but it let us see where Turner's head is at. He tried to do the right, "moral," merciful thing, and a dozen people were murdered, including his partner. The sound design when Turner agreed to hand Campbell some leads was great. It sounded like screaming. Beyond that, there were two main things that had to be accomplished. The Mutant Underground needed to side with the Frost Sisters, and the Struckers needed to... have a plot? Okay, so Reed and Caitlin's sudden decision to flee to Mexico was rather ridiculous, especially since it was obvious that it was never going to actually happen. I was waiting for Lauren and Andy to simply refuse to go. It's not like their parents could physically drag them away. Oh, well. At least Wes came back, possibly giving meaning to his previous screen time. I was far more interested in the Frost Sisters and the dilemma that they posed to the Mutant Underground. The X-Men are brought up a lot, and it's easy to see why Marcos and Johnny would want to emulate them. It's also just as easy to see why Lorna and Clarice would want to do the opposite. Like the Struckers returning to Atlanta, it was obvious that everyone would ultimately side with The Hellfire Club, but the discussion did bring up some fascinating moments. Oh, Lorna. Why am I worried that you're going to take after your dad? (Everyone knows who her dad is, right? Is this a spoiler?) I've alternated between Marcos, Andy, and Lauren as to who will be the show's version of Anakin Skywalker, but now I'm thinking that it's going to be Lorna, especially now that she has a power boost. Amazing what pregnancy can do to someone, especially considering that it's still fairly early on. Will her powers continue to increase as her child develops? That would be kinda cool. I'm also very interested in the Hellfire Club. Do I wish that they were introduced about four episodes earlier? Definitely. Still, they add a third side to a conflict that was largely good, plucky, underdog rebels and evil, scary, fascist government. Who was the mutant that the Frost Sisters were talking to? Who are the Kings and other high ranking members? I was under the impression that most of the mutants who could be fulfilling those positions were gone. Damn it, why do I have a feeling that that reveal will be the finale cliffhanger? The main reason why I wanted the Club to be introduced earlier is that right now they seem like a deus ex machina. Everything is going perfectly according to plan for them. I want to see the Frost Sisters, and by virtue the Club, trip up in some way. Fail. Have something unexpected happen that they didn't account for. Make them fallible, even if they are a fantastic breath of fresh air on this show. The two hour season finale will be in two weeks. 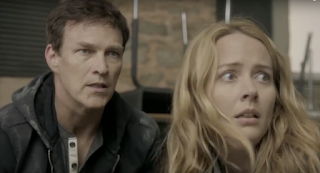 No word yet on if The Gifted has been renewed or not. The opening scene of the two funerals was absolutely stunning. As was the short, quiet moment where Johnny was allowed to grieve for Dreamer. Seeing the three sisters together made for some stunning images. Was this the first time that we've heard about the Purifiers? I'm a little iffy on how combining mutant blood let them combine their powers. Also, having a big, heavy thing strapped to one arm seems like it would seriously restrict your movement and therefore usefulness. Lorna is bipolar? Did we know that? Marcos: Look, stay on the back roads. Caitlin: And stick to the speeding limit. That's my superpower. Marcos: We trained you well. Lauren: Come on. We're supposed to be in school. Andy: Now? I mean, everybody's freaking out about the triplets and we have to go do algebra? Andy: Are you Esme? Or which one? Esme? : Oh, what does it matter? There were some pacing and plot issues that I think are just a part of The Gifted at this point. Still, I really enjoyed this episode and I'm sad that I have to wait two weeks for the next one. This show has gotten better, and I'm enjoying the not-so-subtle references to familiar characters. I'm hopeful that the setup for season two will get the characters out of the holding pattern they've been in since episode two - but I'm not going to cry if it isn't renewed. I'm here for the X-Men connection and Amy Acker, and while I loved Burn Notice, Matt Nix really seems to be struggling going from mostly episode-of-the-week with minor overarching season plots to a serialized story. Katie Hart asked why Runaways isn't being reviewed here, and Fangirl responded, As for the site overall, I think that the answer is always too much good television and not enough manpower to review it all! which is exactly what I would have said. Billie, Fangirl, I completely understand timing-wise why Runaways is not covered, just probing in case there was another reason why the site wasn't even looking to cover it (for example, since it focuses on teens, too many Marvel shows already) and to bring it to your attention as a quality show! Also, just saw that The Gifted was picked up for season 2! Yeah, even my own TV site is gathering mothballs. While I can write decent reviews, I don't enjoy it. Occasionally I'll rant (or rave) about an episode for a few paragraphs, but reviewing TV episodes doesn't add to my TV-watching experience, and sometimes detracts from it. I also like connecting the dots between various episodes and shows, which doesn't really fit well with the format of this site (which works much better, spoiler-wise). I did consider offering to write a season one review of Runaways for the site, but I know nothing about the source material. Also, I'm far more conservative than most of the writers on this site (and in TV in general), and while I can appreciate well-crafted characters and storylines even if I don't agree with the choices made, it's hard to share my thoughts or fairly evaluate those situations/characters when I feel like I'm navigating politically-correct minefields. And the last thing I want to do is offend people or start arguments. So I've pretty much shut down all media commentary other than occasional comments or tweets about things I love.